Throughout the world, natural gas is transported long distances in pipelines under high pressure needed to maintain a high volume of flow in the pipeline network. However, before distributing gas to homes and businesses, the pressure must be reduced, which is undertaken at let-down stations, typically located on the edges of population centers, and as the pressure is reduced, the gas cools as it expands. To prevent the gas systems and pipeline from freezing, the let-down stations use a gas-fired burner to generate heat. This standard practice fails to harness the energy lost from this pressure reduction process and the combustion-based boiler that produces the needed heat emits pollutants and carbon. 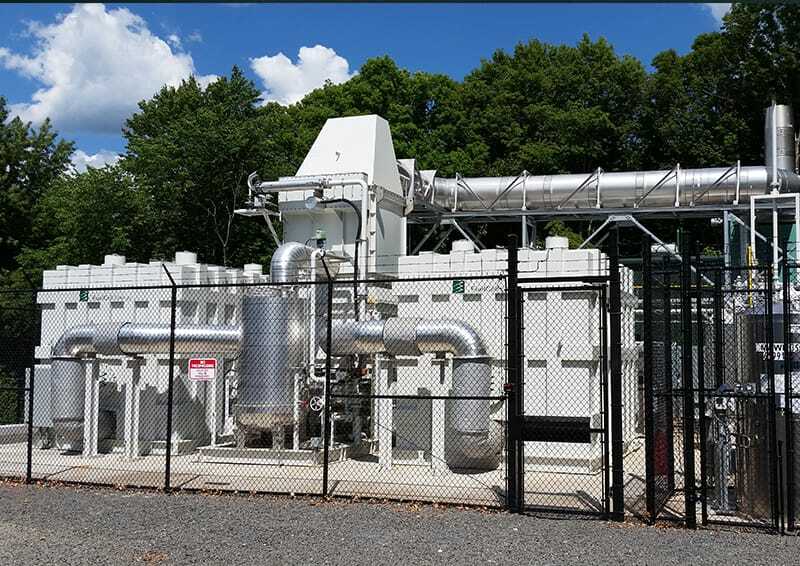 FuelCell Energy’s SureSource Recovery plant is located at natural gas letdown stations to generate ultra-clean power and heat and to utilize, what is in essence, ‘free’ energy from the pressure-reduction process to generate additional zero- emissions power, all in a highly efficient manner. The SureSource Recovery solution is comprised of a SureSource fuel cell plant and a turbo-expander. The turbo–expander electricity production is based on the amount of gas flow through the pressure-reduction station. The fuel cell, configured for combined heat and power (CHP), provides the heat otherwise produced from the gas-fired boilers, improving the station’s carbon footprint and reducing emissions. The combination provides a unique, continuous and variable output electric power generator. The solution operates in parallel with the existing let-down station and offers the utility station operator the ability to add a clean grid power resource at the station, while improving the efficiency of the natural gas delivery system.